The ethos of Action Mental Health and its focus on helping people to recover from mental ill-health was what attracted the charity’s inaugural runner to sign up for this year’s Belfast City Marathon. Craig Downey was the first person to pledge all the money he raises by tackling the gruelling 26.2 mile run, through the city this spring, to Action Mental Health. 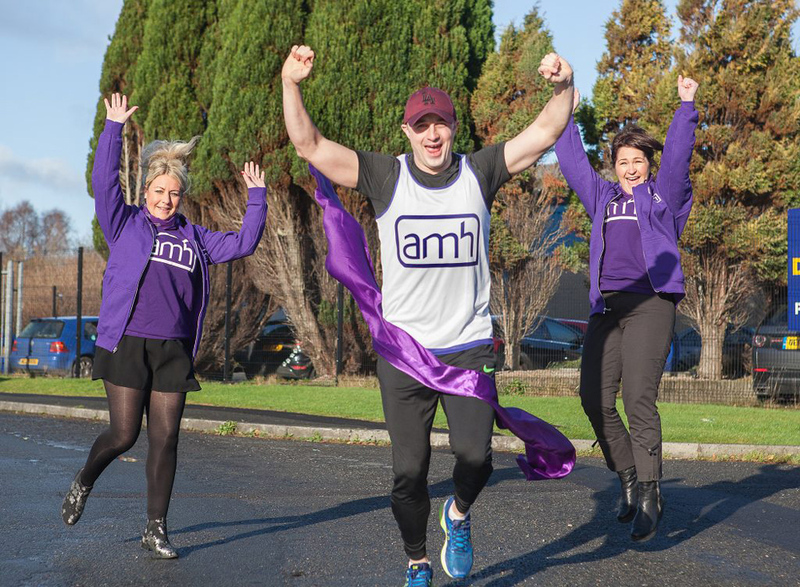 The 31-year-old electrical engineer, who is originally from Derry/Londonderry but who now lives in Antrim, will be donning the AMH purple with pride on the bank holiday run which this year takes place on Monday, May 7. It will be Craig’s second marathon, having already run the Lough Ness Marathon in Scotland. Over the years Craig has fundraised for numerous charities but this year opted to run the marathon for Action Mental Health, due in part to the greater spotlight currently being shone on the issue. But Craig, who adds weight training and CrossFit to his list of physical hobbies, also has a more personal reason for choosing a mental health charity. “I’ve got a few family members who suffer from anxiety and I’ve suffered from anxiety myself. I’d have weeks and months that would go by, fine, and then something would trigger it and it snowballs. “I want to promote the fact that some men especially, who suffer from this type of thing, are afraid of speaking out to tell anyone else about it, or of showing any weakness, physical, mental or emotional. “My girlfriend is also a mental health nurse and it’s just the fact that this can affect all walks of life, whether you’re rich or poor or whatever, it doesn’t discriminate, same as cancer. “I want to promote the thought that if you are struggling, you have to take that first step and talk to someone about it,” he added. After deciding upon a mental health charity, he explains why he chose Action Mental Health. Craig has already drawn up his marathon training schedule and will soon be doing forty miles per week, at the least, to get into his best shape for the spring event. “I don’t believe in putting your body through something like this without doing it all for charity,” he says, and hopes to beat his last marathon time of 3.5 hours whilst raising at least £1000 in sponsorship. Action Mental Health’s Events Officer Callum Clark is delighted to welcome Craig into the growing stable of fundraisers who raise much needed funds to help the charity provide services for people of all ages living with a range of mental health issues as well as promoting positive mental health to children and young people across Northern Ireland. “Having people like Craig don the purple jersey for Action Mental Health means so much to us. If you have been inspired by Craig’s story, why not sign up for the Belfast City Marathon to run, walk or relay on behalf of Action Mental Health.